Please click to watch the retreat highlights. Praise the Lord for an edifying retreat held from 5/1-5/5 in Holland. 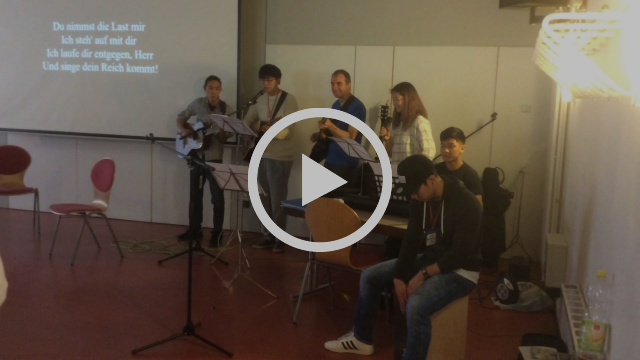 Pastors from Chinese churches in London, Madrid, Germany and Holland together with the Pastors from CCA had a blessed time worshiping, listening to God's words, praying and fellowshipping. Grateful to our Father that over 300 adults and 70 youth participating in the Germany Christian Transformation Camp. More than 30 people accepted Christ. The two sons of Pastor Lee faithfully served in the Youth worship. Please click to watch the video. There were two brother and sister baptized on the Mother's Day Sunday Service. Church retreat was held in June and one more sister was baptized. Youth Pastor, Christian, just began his serving and quite a few youths came to church already. Pray that God to guide him in the ministry. Pray for Pastor and Mrs Lee to have strength in serving and pray for leaders' and congregation's spiritual growth. Thank God for watching over Rev. Alexis Chung's operation! Recovery process is satisfactory. Please continue to pray for his recovery as well as Mrs. Chung's additional ministry load. Praise the Lord! Pastor Zhang was ordained on 5/31. Pray for God to lead and bless their ministry in Madrid. Please pray for the ME, may God's light shine on this land and people will know the truth. Please pray for sister S as she has just moved to a new apartment. Pray for adjustment as well as God to open opportunities for her to have 'salty' conversations with her neighbors in the Holy month. Please pray for God to open path and provide workers to shepherd the church in Tel Aviv. CCA is in the process of sending a Chinese worker to TA. May God's will be done. Praise the Lord! Pastor and Mrs Hui are on home assignment, they have shared at over 20 Alliance churches. They will return to China in July. Their goal is to partner with a city church and develop missions education and mobilization. Please pray for them. Please also pray for their daughter who will go to Taiwan to study as well as their son will transfer to another college in Fall. Pray for their adjustment and protection. Please pray for Canada Chinese Opera STM, they will serve at Panama City from 8/11-13 and Chitre from 8/17-21. Sister V was an Alliance worker served as a trainer for Christian counselors in China for over 7 years. She has now returned to the States and will begin her PhD program to re-equip herself. Please pray for God's guidance and provision as she moves to the College. Please pray for her adjustment from being a full time local counselor to an distant trainer. Pray that she will fix her eyes on Jesus and have faith to embrace the challenges that God will bring forth in this next stage.